The last Made it Monday of January; it is hard to believe how fast this month went by (not that I'm complaining being pregnant and all...). This week I made something with my mother-in-law that will welcome spring beautifully. She is an expert arranger and I help. This is one of the two we came up with that day. 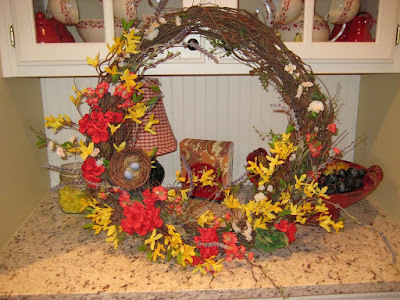 Basically, you buy some pretty flowers in at Hobby Lobby, cut them apart, hot glue them to a grapevine wreath, and before you know it you have a new spring wreath. 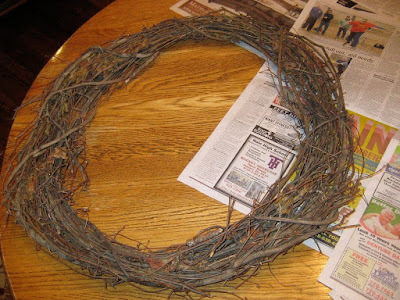 Anyone have any ideas for how to keep real birds from nesting in your wreaths? I would love to know. 1. Enter the link to the post you are showing off; not the home-page of your blog. Made it Monday: Label those keys!